We accept all types of group bookings and can arrange your itinery for the duration of your stay. We have an on site restaurant and can organise food buffet requirements. The resort is especially close to nature and the peace and quiet would be perfect for yoga retreats. 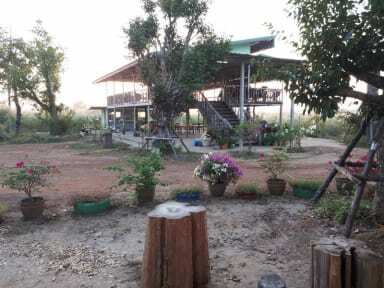 Vongkham Eco Resort has been built from scratch based on an idea of providing a getaway from the city and also as a springboard to the rural communities and attractions in the local area. It is a place to relax and unwind in an established garden and close enough to all amenities.It is set in a hectare of land with over 150 trees including Lychee, Longon, Dragon-fruit, Tamarind, Papaya, Mango, Coconut, Banana, Almond. Various established plants and flowers are actively grown throughout the year and large marigold flower field provides cash crops for festivals and buddhist ceremonies. The organic garden's fruit and vegetables are used in the kitchen.Ducks, geese and chickens roam free and there is plenty of natural wildlife. Bird song can be heard at dawn and dusk and sunrises and sunsets can be crimson red and orange. Mountain bikes on site are free to use and with over 50 kilometres of dirt tracks, it makes riding the bicycles to see the surrounding scenery a must. 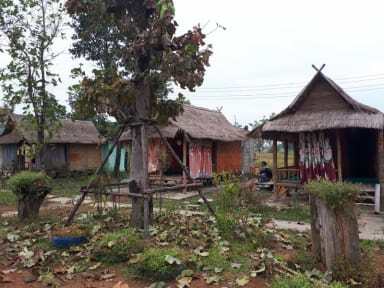 Don't be surprised if on your bike travels you get invited into peoples homes to experience real Lao hospitality and culture. The tents and huts are furnished and electricity; lighting and fans are supplied. There is a shower block and toilets in the camping area, bamboo huts have en-suite bathrooms. Private quadruple rooms and chalet bungalows have toilets, showers and air conditioning. I’ve been there for about a week and it was definitely the best hostel I’ve ever been! The location is awesome, the tents are really good and the price is cheap as well. The owner Vincent is unbelievable friendly and he will help you with everything you need, you just have to ask! It is a bit outside of the city, but you can get a really cheap bus every 30min. I will definitely come back in a few years to check how the place looks like, because vincent has big plans for the resort! Thanks mate! We really enjoyed our stay. It's very relaxing and chill and we loved our tent. Also enjoyed the food, it was nice that we didn't have to go anywhere! Super nice family business. We stayed in one of the tents and it was such a nice break from the hecticness of travelling around South East Asia. Very relaxed, welcoming atmosphere with lots of places to rest and read a book or play billiards and darts. Staff are amazing. Would suggest staying at least two nights because it’s a 30-40 minute drive out of Vientiane centre. At the campsite, I found everything I look for when I travel: genuine hospitality, adventure, and a local experience. Vince accepted me as one of his own family members and let me share 2 wonderful nights with his family. Eating, drinking & sharing stories. This was the highlight of my trip to Laos. It’s off the beaten path but the free mountain bikes ensured that I got to truly experience the area and the local community. If you’re looking for a genuine serene and special experience, come here. Lovely location and lovely property, with lots of different plants and wildlife - a really lovely rural retreat! Very relaxing, great facilities, lovely food and drink. Host was very chatty and gave us good recommendations for things to do. Apart from the host, none of the staff spoke any English, which presented a few problems with checking in, ordering food, sorting WiFi etc. Also worth noting that it’s a 40 minute bus into town, which was fine for us but may not be what some people want!